(ideas.) I was talking with a friend about the political power of intolerance the other day. She was making the case that our national election exposed the prejudice of a populace that, despite the label-makers, cannot be described simply as poor, white, rural Americans. The demographics of intolerance, she argued, are far more complex – take a walk today through most any discount department store and you’ll realize how out of date we are with our stereotypes. Anyway, our conversation reminded me of one of my favorite interviews that I conducted while writing my book. I was at Manuel’s Tavern talking to Panke Miller, who I had met through a mutual friend. She described the City of Atlanta in the late 1960s and early 70s as a remarkably open and welcoming place, where anything could happen. Much of the suburbanizing white middle and working classes, she said, was made up of natives who had been resisting integration. As they left, they took their intolerance with them, and “outsiders” with more progressive views began moving in. As a result, the local political representation in the east-side neighborhoods was “shifting toward hippies and women.” She described the new atmosphere in the city as “a wide-open place,” when she moved to Atlanta in 1969. Anything, it seemed, was possible. I realize that early auto-suburbanization in the United States was about more than race and intolerance. Panke’s story, however, described one role that it did play. She recalled a city made freshly open by change, and as a city planner, I was particularly fascinated to hear white flight described as a good thing. I titled that chapter A Wide-Open Place. The departing masses didn’t like certain aspects of the city’s new openness, and their exodus only amplified change within the city limits of Atlanta. They moved out, but they didn’t disappear. Combined with other newcomers and other motives for suburbanization, they remained a force that would instead govern the region, laying the physical and cultural groundwork for the sprawling metropolis we know today. In the process, through both their politics and buying power, they fundamentally reshaped all of our lives. It’s important to note that because the momentum of economic opportunity was on their side, this group of change-makers could define change on their terms. For example, the early prosperity of the suburbs was limited deliberately and disproportionately to white people. Meanwhile, the central city was left to everyone else, including the tolerant, poor, and marginalized. But while most history books have remembered downtowns in the second half of the last century as sad reminders of what the future left behind, through the eyes of Panke and others, cities like Atlanta began to represent the ideals of a model democracy. They were cheap and politically open, and they became havens for diversity – places that welcomed otherness. Beyond simple tolerance, cities offered marginalized citizens the opportunity to live the lives that they wanted. People had more freedom to love who they wanted, spend their time and money how they wanted, express themselves in ways they wanted, and hold views that were at the margins of mainstream America. By accepting and including everyone, cities amplified and exemplified the political and demographic expanse of a democratic society. They had significant challenges, too, of course, but no matter if you were black or poor or gay or other in any traditional sense, cities offered a place where you could more easily find some space to be you. Today, thanks in large part to the work and influence of those very people, many cities are once again shining centers of American prosperity and increasingly, are at the front lines of growth. Acknowledging this, it is essential to understand that the success of cities is born from their tolerance, which fosters collaboration; from their infrastructure and cultural resources, which are the results of investment; and from their compactness and diversity, which spark chance encounters and lead to artistic and entrepreneurial innovation. There are a lot of reasons why the success of cities will not easily be undermined by our new national politics. At the same time, let’s not be naïve. If we understand how capitalism works in a growing economy unfettered by policy, we can anticipate what will happen next. Intolerance is going to decide it loves cities. And then it is going to move there. Sometimes, I feel like this is already happening. And because the diversity of cities was the result of their shrinking economies more than policy, in most places that are growing today, there’s nothing to stop this; nothing to even mitigate the challenges that come with that growth. For people who value the diversity of cities, this threatens everything that we love – the most obvious example is the rapid loss of affordability. Like suburbanization last century, however, the momentum of economic opportunity is now in our favor. We should be able to leverage our political and buying power to protect the diversity of cities and define change on our terms. To do that, we need to build a welcoming wall of diversity. 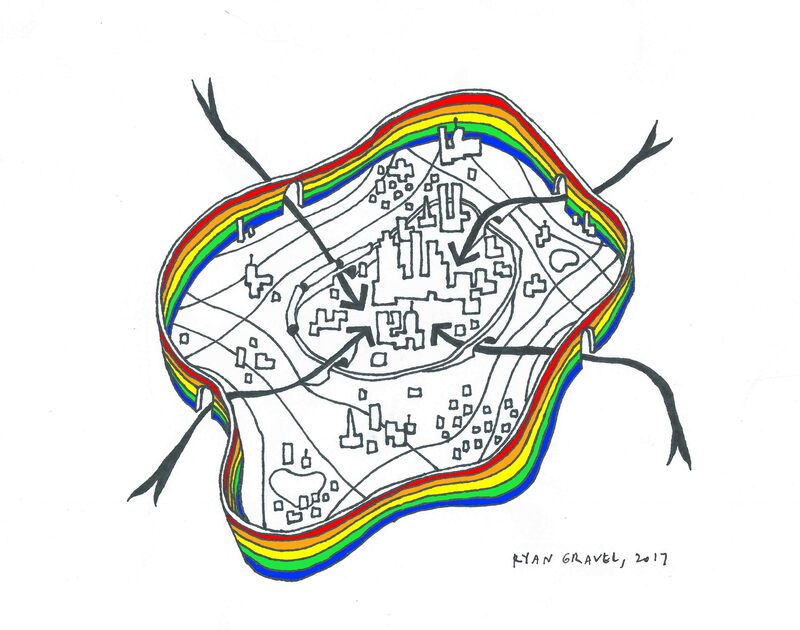 Rather than cede cities to intolerance and reinvent our lives somewhere else, we need to prepare, protect, and resist by doubling down on our otherness – by enshrining diversity and equity into every ordinance, regulation, incentive, code, and practice. We should teach it in our schools, hoist it high on our flagpoles, and bring it up in every conference room, locker room, and cocktail party. In any engagement and with every acquaintance in the public, private, and nonprofit sectors, and without exception, our economic prosperity must be defined by a prerequisite of diversity protection. For everything that is moral and just; for our self-preservation and economic opportunity, we must make sure that our business districts, civic spaces, cultural venues, and historic sites are accessible only to those willing to enter with keys of tolerance. Our investments in transportation, higher education, the arts, and public life must come with the ticket price of fair access, affordability, and inclusion. Our commitments to equitable opportunity, justice, and innovation must be built not simply out of words, but with the bricks and mortar of accountability, action, and investment. Such a wall of diversity can protect us, but we’d better start building it now. Maybe Mexico will chip in to help pay for it. >> Ryan Gravel > more about the infrastructure of inclusion in my TED talk. What an excellent piece you’ve written here, Ryan! Wow. Thank you so much for posting your thoughts on this subject, Mr. Gravel. I am a transplant from Miami and live in the ‘burbs now. When I arrived to Metro Atlanta six years ago, I participated as an artist in the Art on the Atlanta Beltline initiative for two years. I actually mentioned you in my art proposal, because I, too, appreciate the way cities in Europe handle their infrastructure and transportation (I lived in Karlsruhe for a year). I truly hope that your understanding of the need to preserve the beauty of diversity in cities and your decision to resign from ABI will motivate city officials and investors to protect that vision. As an art educator, I would love to move downtown near the Beltline. But, it’s totally out of my financial scope. So, I am now looking at the south side of Decatur, Belvedere Park area, specifically. Would love to hear your thoughts about the promise of that area.